Ashcraft Design’s Design Director, Britt Ashcraft, was fortunate enough to be asked to write a feature article for Innovation Magazines Yearbook of Design Excellence issue. His article highlights some of Ashcraft’s design methodology used to turn problems into assets to create innovative products and experiences. You can read the article below the following paragraph. 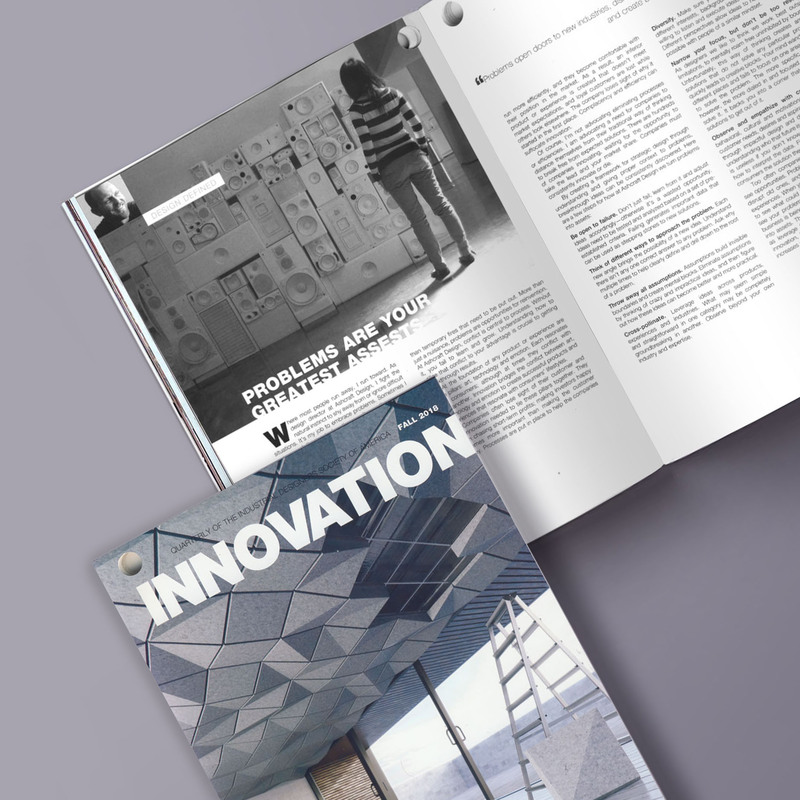 INNOVATION magazine is the voice of the industrial design profession, providing in-depth coverage of industrial design issues while communicating the value of design to business and society at large. It is one of the best places to learn about the practice of industrial design. This award-winning quarterly reaches more industrial designers, fortune 500 companies, universities, associations, and design consultancies in North America than any other ID publication. It is the publication designers go to for content and substance on industrial design. Where most people run away, I run toward. As design director at Ashcraft Design, I fight the natural instinct to shy away from or ignore difficult situations. It’s my job to embrace problems. Sometimes I even search them out when they aren’t even there. Over my 14-year career as an industrial designer, I have seen a lot of companies treat problems as temporary annoyances that need to be quickly dealt with in order to get back to business as usual. Few companies treat problems as catalysts for growth. I get it, though. It’s human nature to want to avoid conflict; no one likes the uncomfortable feeling that comes with adversity. The irony is that conflict is crucial to growth. It’s the key to innovation. When problems happen, the only way to overcome them is to solve them. Not giving them the attention they deserve puts companies at risk. Companies need to learn to embrace problems as opportunities rather than temporary fires that need to be put out. More than just a nuisance, problems are opportunities for reinvention. At Ashcraft Design, conflict is central to process. Without it, you fail to learn and grow. Understanding how to utilize that conflict to your advantage is crucial to getting breakthrough results. At the foundation of any product or experience are three pillars: art, technology and emotion. Each resonates with consumers; although at times they conflict with one another. Innovation bridges the conflict between art, technology and emotion to create successful products and experiences that resonate with consumers’ lifestyles. doesn’t meet market expectations, and loyal customers are lost while others look elsewhere. The company loses sight of why it started in the first place. Complacency and efficiency can suffocate innovation. Of course, I’m not advocating eliminating processes or efficiencies. I am advocating a need for companies to distance themselves from their traditional way of thinking to break free from expected solutions. There are hundreds of companies innovating, waiting for the opportunity to take the lead and your market share. Companies must consistently innovate or die. Be open to failure. Don’t just fail; learn from it and adjust ideas accordingly—otherwise it’s a wasted opportunity. Ideas need to be tested and analyzed based on a set of pre-established criteria. Failing generates important data that can be used as stepping stones to new solutions. Think of different ways to approach the problem. Each new angle brings the possibility of a new idea. Understand there isn’t any one correct answer to any problem. Ask why multiple times to help clearly define and drill down to the root of a problem. Throw away all assumptions. Assumptions build invisible boundaries and create mental blocks. Eliminate assumptions by thinking of crazy and impractical ideas, and then figure out how these ideas can become better and more practical. Cross-pollinate. Leverage ideas across products, experiences and industries. What may seem simple and straightforward in one category may be completely groundbreaking in another. Observe beyond your own industry and expertise. people of a similar mindset. more specific the question, however, the more dialed in and focused you must be to solve it. It backs you into a corner that requires creative solutions to get out of it. they never knew they needed. Too often companies focus on problems, failing to see opportunities. Problems open doors to new industries, disrupt old ones, and create breakthrough products and experiences. When you focus only on what’s wrong, you fail to see what could be right. Change your perspective and see your problems as assets. The key to any successful business is being able to transform problems from liabilities into assets. The brands that rise to the top use problems as leverage for growth. This approach to design drives innovation, brings new customers, grows profitability and increases sales.